Last edited by Stimpy; 01-04-2010 at 03:13 PM. I love that you've used the tree and an element of the tree (the leaf) as the two chosen objects. Also like that you've set the whole thing on angle, making for a more interesting piece. Love the coloured paper and think the white edging is used to great effect. Well done. 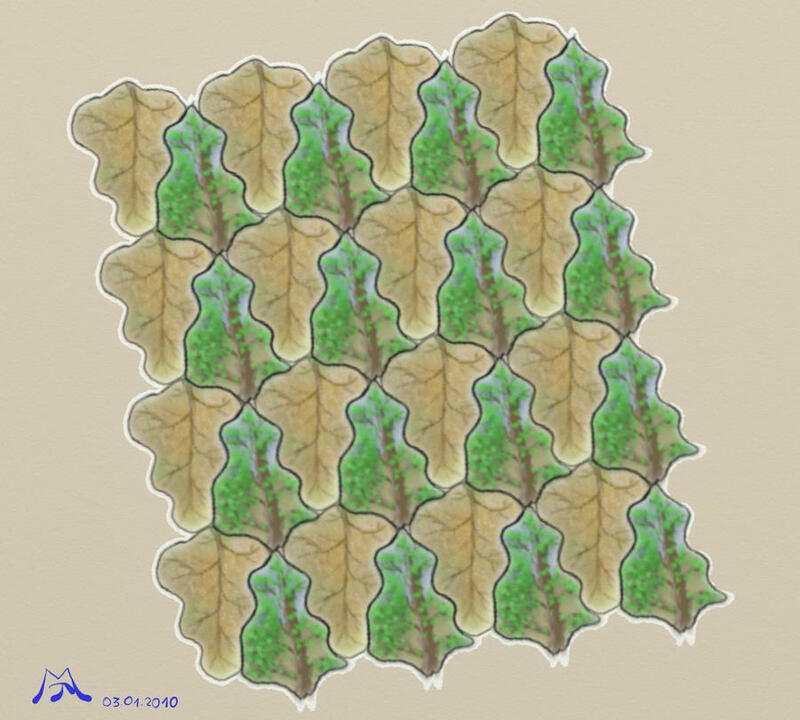 What an interesting and wonderful artistic concept tessellations are! I did go to the links provided as well as looked up Escher on Wikipedia. I just love what you've done! Having a tutorial would be really nice to share with everyone, too! This would be a great art project to start in this forum as well. I found this one very interesting to look at and very well painted indeed. It has that illusion I can see. Great work. This would be a great art project to start in this forum as well. Stimpy, a terrific project and a terrific puzzle, especially making it not just technically interesting but aesthetically interesting too. These are challenging, 'eh. I think you did great. Looking forward to what you come up with next, and hearing what you learn along the way. EDIT: Afterthought: I wasn't clear from your exchange with Juzzy if you do or do not want the white border. If you don't a good trick here is to make an under-layer, select the background color with the color picker, and with the inkpen run it along the white area below your image layer. "Pick" the background color with the lighting off so the color pick is an exact match. Turn it back on after the paint application. (This is a good trick too for hiding pixels that simply won't "fill" on fills.) Further note, if your image here is 100% opaque, you can accomplish the same thing by making an under layer filled with the background color and not bother with the ink pen tracing the white area. In either case you don't have to worry about losing your image edge from a "blend". This is a very interesting design, it would look great as wallpaper. Oh man. My dream: someday live in a house with custom Escher wallpaper. That would be sooo nerdy. I'd have everyone in the math department at Purdue in love with me. Fantastic idea. It'd be hard to fall asleep looking at it though. On a related note, Peter Chiykowski once said that the only responsible use of a time machine is to get Escher to write video games. I think I have to completely agree. "Happy accidents' can be a really good thing. Here is the piece with the background quickly fudged into the white area... I don't think it is as visually strong without the white edging as the original you posted with the white edges. I suppose if we took a pole it will be different strokes for different folks on the border question (?). But one thing I love about Juzzy's quick little exercise is showing how such a simple thing can have such a large visual impact. It's like two different paintings to me - both with different merits. Each carries your eye differently around the painting (at least that is so for me).